Trazodone Drug Class: Is Desyrel A Narcotic Or Controlled Substance? Trazodone Drug Class And Schedule: Is Desyrel A Narcotic? There are many questions about Trazodone drug classification due to the multiple ways the drug is used. Its properties are very similar to several types of drugs and cause many problems with the schedule and class of this medication. Firstly, is Trazodone addictive? What effects does it have and how can it be classified? Trazodone uses are not limited to the general antidepressant effects. This medication is known to disrupt the activities of neurotransmitters that coordinate brain functions. The drug is considered a mild serotonin reuptake inhibitor as well as a mild antihistamine. 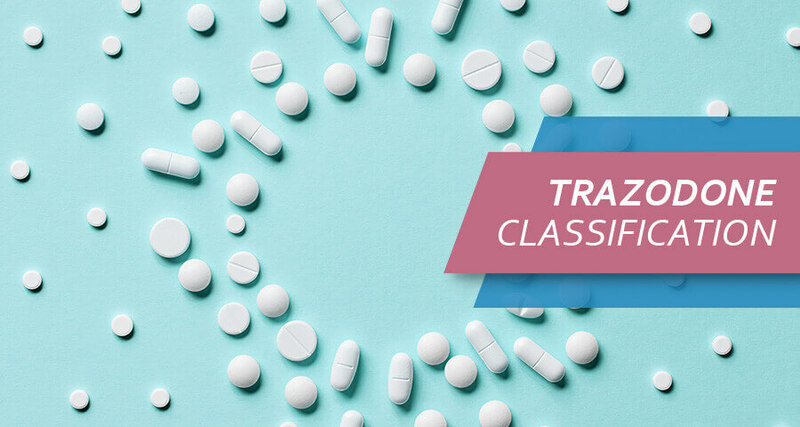 So, what drug class is Trazodone? Trazodone is an antidepressant drug also known as generic Desyrel, Oleptro or Trialodine. Since the approval of Trialodine by the FDA in 1981 the drug has been applied in many fields of medicine and classified according to its functions. Trazodone classification is often misconstrued due to its similarity in function to other drug types. Is Trazodone A Controlled Substance? Is Desyrel A Sleeping Pill? Is Trialodine A Muscle Relaxant? Is Desyrel An Antidepressant? Which Type? Trialodine may induce a hypnotic effect as a serotonin modulator; however, is Trazodone a controlled substance? Trialodine affects the activities of norepinephrine, serotonin, and dopamine. Its impact on the brain causes increased energy levels and activity. It acts to restore serotonin balance in the brain. So, is Trazodone controlled? A substance that can be termed as “controlled” is one that is illegal or purchased over the counter with a strict prescription for certain specific conditions. The laws on controlled substances are regulated by the federal government to mitigate the distribution of harmful drugs. On this basis, is Trazodone controlled? No, it is not, at least not in the United States. There are a few off-label applications of Desyrel which are not approved by the federal Drug Agency. The Trazodone narcotic misconception is quite common because of this. So, is Trazodone a narcotic? No, it is not. Even though they are sometimes administered off-label and for investigation purposes for conditions such as alcohol withdrawal, schizophrenia, cocaine withdrawal, erectile dysfunction, obsessive-compulsive disorder, and other health issues, or tend towards abuse, it is not addictive. However, tolerance for this drug can be developed, especially in the case of Trazodone recreation use. Is Trazodone A Sleeping Pill? Trialodine has been prescribed for people with cases of insomnia, specifically for people with severe depression, panic disorder, and used to calm migraine. Is Trazodone a sleeping pill? Yes, it is often administered in a low dosage in the place of benzodiazepines to induce sleep. The Trazodone dosage for sleep may depend on the medical doctor’s specification. Trazodone sleeping pill comes in 100mg and 50mg tablets. Some people have experienced alterations in weight while on Desyrel medication, so, does Trazodone cause weight gain? Simply put, weight gain or loss is one of the numerous possible side effects of Trialodine, along with dizziness, swellings, vision impairment, diarrhea, and others. Trazodone half-life on usage is 5-9 hours, and it should only be prescribed by a medical professional to avoid a Desyrel overdose. Benzos are used as sedatives, muscle relaxants, and anticonvulsants. Is Trazodone a Benzo?? From all indications, it is not. While Trialodine regulates the activities of neurotransmitters, benzodiazepines reduce activities of neurotransmitters by enhancing the mechanism of action of gamma-aminobutyric acid (GABA). 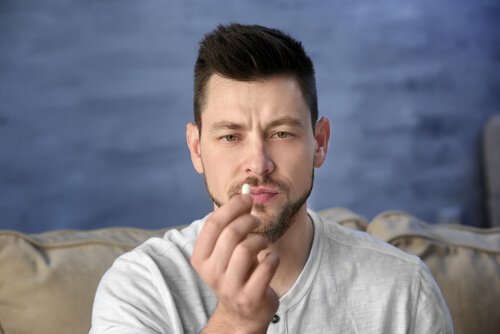 Clinical psychiatrists use Trialodine as an alternative to benzos because some patients may be prone to addiction or abuse if treated with a benzodiazepine. The Trazodone antidepressant may help with cases such as insomnia, and it does not cause functional defects to the brain, unlike benzodiazepines. Opioids and opiates are classes of drugs that are considered as extremely addictive. They include prescription drugs such as hydrocodone and oxycodone as well as illegal drugs. Physical dependencies easily occur even on prescription. So what is the relationship here? Is Trazodone an opiate? Trialodine is one of the medications administered in the treatment of withdrawal symptoms of opioid addiction. So, is Trazodone and opioid? No, it is not. However, it’s is quite useful in dealing with the psychological symptoms of opioids and barbiturates. Trialodine, if taken wrongly with other drugs, may lead to serotonin syndrome. Mixtures such as Trazodone and weed can lead to serious health problems as the drug will naturally escalate the effects of the substance. The Trazodone class of antidepressants may react negatively with other medications such as MAOI; allow two weeks gap before switching to either one. Is Trazodone A Muscle Relaxant? The term “muscle relaxant” is used to categorize drugs that reduce tension in the muscle fiber and causes a form of relaxation. Some muscle relaxants work on the central nervous system to dampen stimulated nerves, causing a reduction in activity, while some relaxants work specifically on the muscles and cause drowsiness. Desyrel is prescribed for insomnia and helps the muscles to relax. It can cause drowsiness and dizziness which can be problematic if one is operating heavy machinery or driving. Even though Trialodine may induce sedation while improving the quality of sleep, it is not a muscle relaxant and cannot be used as an alternative to one. Desyrel is not an SSRI. Selective Serotonin Reuptake Inhibitors (SSRI) are typical antidepressants while Trialodine falls into the category of atypical antidepressant. SSRIs limit the reabsorption of serotonin, and Trazodone inhibits the reuptake of serotonin, norepinephrine, and dopamine, and also antagonizes the α1-adrenergic receptors. So, it has more possible functions than SSRIs. Desyrel cannot be an MAOI due to its structure. Monoamine Oxidase Inhibitors are antidepressant drugs with a completely different chemical composition. They inhibit monoamine oxidase enzymes and prevent the breakdown of monoamine neurotransmitters instead of inhibiting the reuptake of some chemical compounds. Oleptro is not the TCA, as they have a different mechanism of action and structure. These drugs work as serotonin and norepinephrine transporter blockers, thereby increasing their concentration. Tricyclic antidepressants are also quite effective, but their side effects are too severe. That’s why they were mostly replaced by the newer classes of the antidepressants. By the way, Trazodone was the first non-tricyclic antidepressant approved by the FDA. Trialodine is not an NRI as this type of antidepressant drugs acts as reuptake inhibitors for norepinephrine and epinephrine, but does not antagonize the α1-adrenergic receptors. Their mechanism of action is different. Trazodone is a SARI – Serotonin Antagonist And Reuptake Inhibitor and also has the sedating effect. It is potent serotonin and α1-adrenergic receptor antagonist, a weak serotonin reuptake inhibitor (SRI), and a weak antihistamine. Trialodine is a triazolopyridine derivative and atypical antidepressant. Its mode of action involves the prevention of serotonin reuptake and the prevention of particles of serotonin in the synapse from binding to specific receptors that do not enable effective mood circuit functions through nerve cells. It is unrelated to typical neurotransmitter inhibitors such as SSRIs, SNRIs, MAOIs, and TCAs as Trazodone stops neurotransmitters from binding to specific receptors in addition to serotonin reuptake inhibition. Trialodine is an antidepressant also known as generic Desyrel. It is usually prescribed for anxiety, depression, obsessive-compulsive disorder, and other mental issues. It is categorized as a serotonin antagonist and reuptake inhibitor (SARI). The drug is not a barbiturate, although it is administered as a medication for the withdrawal symptoms of barbiturates. Desyrel is not categorized as a controlled substance and can be purchased over-the-counter on prescription. Care must be taken while using this drug as a certain level of dependency may develop if abused. The drug abuse rehab clinics offer different recovery options for those suffering from antidepressant abuse. It is quite possible to treat addiction to prescription medications, especially with professional assistance. Addiction Resource » Addictive Substances: The Anatomy of Drug Addiction » What Is Trazodone Addiction? Desyrel Drug Abuse » Trazodone Drug Class And Schedule: Is Desyrel A Narcotic?